The 35th Infantry Regiment Association salutes our fallen brother, 2LT Joel Alois Matusek, who died in the service of his country on November 27th, 1967 in Quang Nam Province, Vietnam. The cause of death was listed as Booby Trap. 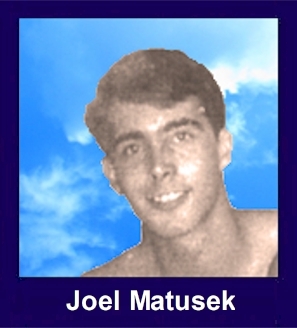 At the time of his death Joel was 21 years of age. He was from Kenosha, Wisconsin. Joel is honored on the Vietnam Veterans Memorial at Panel 30E, Line 98. The decorations earned by 2LT Joel Alois Matusek include: the Combat Infantryman Badge, the Silver Star, the Purple Heart, the National Defense Service Medal, the Vietnam Service Medal, the Vietnam Campaign Medal and the Vietnam Cross of Gallantry with Palm Unit Citation. For gallantry in action in connection with military operations against a hostile force in the Republic of Vietnam. Second Lieutenant Matusek distinguished himself while serving as a Platoon Leader with C, 1/35th Infantry. On 27 November 1967 Lieutenant Matusek's platoon was participating in a search and destroy operation northwest of LZ Ross, when heavy contact was made with a reinforced company of North Vietnamese Regulars. Immediately, he deployed his men to strategic positions in preparation for a counterattack. As he moved to the front of his platoon, Lieutenant Matusek suddenly noticed two wounded men lying in the open. Disregarding his own safety, he moved forward to recover the first man and brought him back to the platoon's medical aidman for treatment. Witnessing the heroic act, the enemy increased the intensity of their fire on that sector of the perimeter. Though aware of the increased danger, Lieutenant Matusek again attempted to extricate the remaining soldier. In doing so, he was taken under fire by the enemy and mortally wounded. Second Lieutenant Matusek's gallantry in the face of enemy fire, determined leadership, and devotion to duty are in keeping with the highest traditions of military service and reflect great credit upon himself, his unit, and the United States Army.